Few franchises are as popular or widely-loved as the one that brought us the bravery of Leia Organa, the quick wit of Han Solo and the overwhelming heroism of Luke Skywalker. Fans across the globe followed their adventures against the evil Sith Lord and his apprentice Darth Vader, while millions more witnessed the wholesome Anakin Skywalker descend towards evil in the prequels years later. The Star Wars series has captured the hearts and minds of countless people through its stunning scenery, thrilling sense of adventure and, more than anything else, its lovable characters. That’s why we want to allow you and your kids to rejoin the Galaxy with our latest range of party supplies. With striking images of Jedis and other characters in action, our movie cups will look great when laid out on your party table. 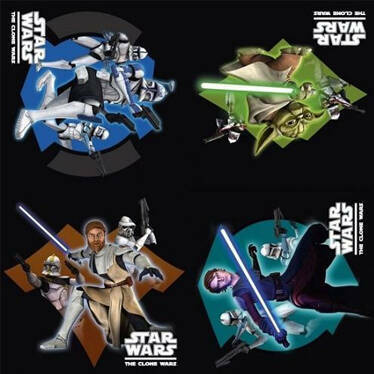 Alongside them you can place your own detailed Star Wars napkins, featuring a range of scenes from the good and evil sides of the force. Not wanting to leave you wanting on the whole set, we also provide Star Wars plates with exciting battle imagery on each one. And finally, featuring everyone’s favourite characters from Obi-Wan Kenobi to Yoda, our loot bags are perfect for kids to take home goodies in afterwards.